The pursuit of excellence could be daunting but the actionable guidelines will encourage people and organisations not to give up. 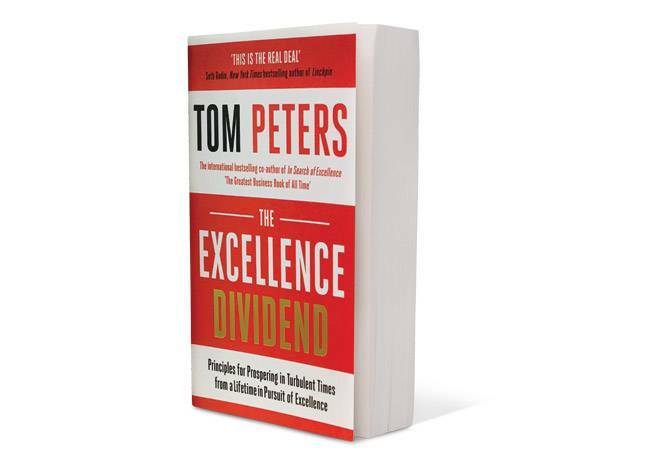 When I started reading Tom Peters' latest book, it seemed more like a 'Do it Yourself' or 'Seven Steps to Being a Successful Salesman' type of book. Then I discovered it has the depth of content along with an underlying framework and significant cross-referencing from how many people have looked at 'excellence'. It is Peters' 17th book, beginning with his co-authored In Search of Excellence, a path-breaking and a successful book published in 1982. I have only been through three of them but realised from the titles that he has been very passionate about exploring and disseminating the spirit of excellence. In his own words, "Truth be told, I have had a love affair with excellence throughout my career." This book is divided into six sections and there is an implicit priority there. I could not agree with the writer more when he puts execution at the top of the list. A quote from Jack Welch given in the book - In real life, strategy is actually very straightforward. Pick a general direction and implement like hell - also reflects my approach. A more stirring call from Swami Vivekananda is on similar lines: Arise, awake, and stop not until the goal is reached. The book, which conceptualises eight basics, has 'A Bias for Action' as the top of the list. How important a need this is for India. The second section focusses on excellence itself. Peters says it is all about doing it now (actually in 'the next five minutes'), building a culture that messages this by emphasising the 'soft' values and learning from the agility of small and medium enterprises. Putting people first is the theme of the third section. Here, the emphasis is on training, being conversant with the highly advanced artificial intelligence (AI) and learning to discover the entrepreneur in oneself. Organised entities will require fewer people because of automation and AI. And thus, sustenance will be through entrepreneurship. Section four highlights innovation, with three important messages - whoever tries the most stuff wins, whoever screws the most stuff up wins and we are who we hang out with. Innovation is essential for excellence. To be successful in innovation, we must be open to trying, possibly failing and recovering. To get the emotional energy for this, it would be useful to be around people and seek mentorship from those who have been through similar experiences. Section five deals with why the obsession with adding value is so critical. Whether it is through design or examining each one of our transaction, a focus on 'how can I add value' is important. It is important to drive effectiveness in all that we do, including things as simple as communication. The last section is on leadership. Listening, paying attention to frontline managers and 'management by walking around' are viewed as key attributes of leadership leading to excellence. A leader understanding the details that enable the organisation to perform is the essentiality. It is also important to recognise that excellence is a function of teamwork more than just having excellent people. In fact, a related theme that a manager must be conscious of is how to get the best out of mediocrity. Some examples of organisations demonstrating excellence that come to my mind are Gujarat Cooperative Milk Marketing Federation (more famous for the Amul brand), Akshaya Patra and Sankara Nethralaya. These organisations do exhibit many of the attributes prescribed in the book. One of the soft values they have is a strong culture driven by a shared value. It is useful to reflect that many of the perceived 'excellent' organisations in the commercial space are multinationals who have penetrated India. Would there be truth in hypothesising that in India, organisations in the social space have a better chance of being excellent rather than those in the commercial space? The book has an underlying theme of focussing on actionable points towards excellence. What is interesting is that all the points have context-independent relevance and thus, have great value for India. However, the examples and quotations are almost entirely from the US context, and it could take an Indian reader a little while to absorb those. Overall, I would recommend this book as a useful read, with insights that are sometimes reinforcing and sometimes challenging.